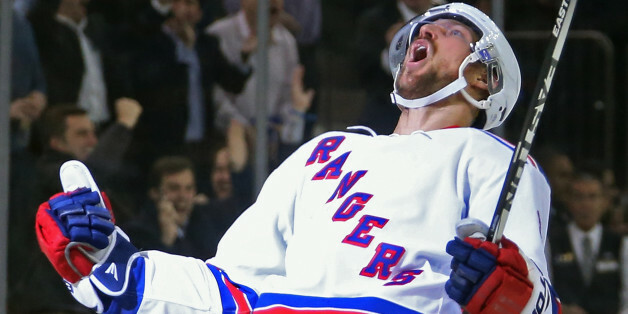 Hockey players are tough, and if you want proof of that, just check out what happened to New York Rangers defenseman Kevin Klein on Monday night. In the first period, he lost part of his ear after taking a high stick from Zach Sill of the Pittsburgh Penguins. 'Tis but a flesh wound. Klein had the chunk of his ear stitched back on and was back out on the ice in the second period and eventually scored the game-winning goal in overtime, leading his team to a 4-3 win. Stompin' Tom Connors "The Hockey Song"
Nothing else comes close to Stompin' Tom's perfectly earnest and jocular celebration of hockey that takes listeners from the regular season straight through to the Stanley Cup finals. Whether it's being blasted from an arena's speakers, covered by the likes of The Hanson Brothers and Corb Lund, or sung by the Canadian country legend himself, "The Hockey Song" is the best song you can name about the good old hockey game. And the best song you can name about the good old hockey game is "The Hockey Song."